You could have a moist sponge cake made with gluten-free ingredients: two layers (flavours include Madagascar vanilla, lemon, chocolate, orange or chocolate-orange) made with organic ingredients and filled with organic buttercream. If you prefer rich fruit cake, I have three delicious fruit cake options, made with organic fruit and Appleton Jamaica Rum, so you get a dark, fabulously moist cake. Need a dairy-free cake? How about a moist, fragrant Orange & Almond Cake, or a sweet, damp Ginger Cake? Both made with gluten-free, dairy-free ingredients. If you want a rich Chocolate cake, click here. For cupcakes, click here. Topped with sweet American buttercream or Swiss meringue buttercream. 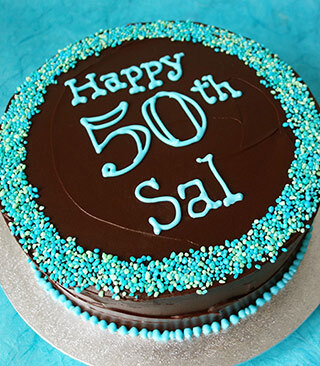 Or covered with sugarpaste icing (not organic) (below), and marzipan, if you like. 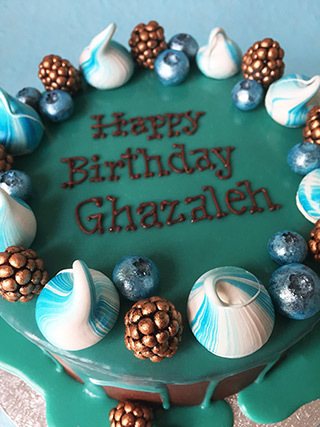 Chocolate cakes are lovely covered with organic dark chocolate ganache (bottom), or a sweeter dark chocolate glaze. Coloured icing contains permitted artificial food colours, and piped icing contains raw egg white from organic, free-range hens' eggs. 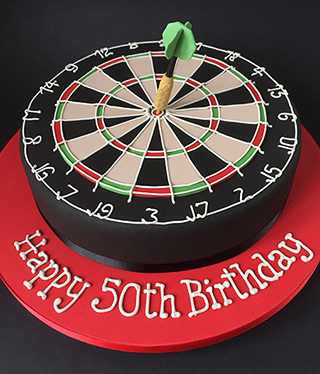 Price from £50.00 for a 7-inch round cake with plain buttercream or icing and simple piped message. More complex designs from £70.00. 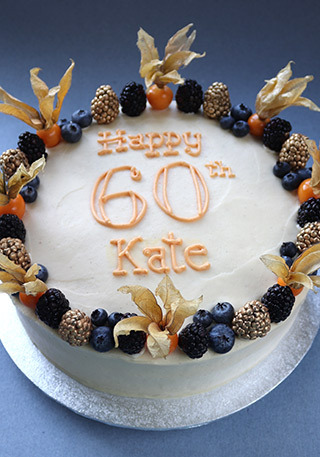 Dairy-free and egg-free cakes are also available: all cakes freshly baked to your specification. Just give me a ring or click below and we can talk about what you need.